Buick invites you to expand your color palette this Black Friday with Buick, in a commercial released especially for this event. 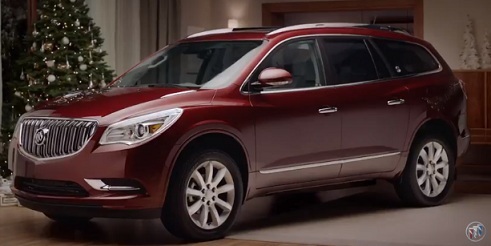 The spot, part of the brand’s “Holiday Shopping Tips” series, features a man sitting in an armchair by the fireplace, informing all the “smart holiday shoppers” that Buick has great deals planned for them this Black Friday and lists some of the hues available for Encore preferred and Enclave Premium models, such as “Crimson Red Tintcoat” and “Quicksilver Metallic”. “Ring in the holidays with Buick.” – the voiceover says at the end of the commercial, mentioning that “it’s the Encore Black Friday event at your Buick dealer” and urging you to get 15% below MSRP on 2017 Encore Preferred. The instrumental part of the song playing in the ad is included in the 2012 single “It’s Alright” by American indie electronic duo Matt and Kim, from their fourth studio album, “Lightning” (2012).